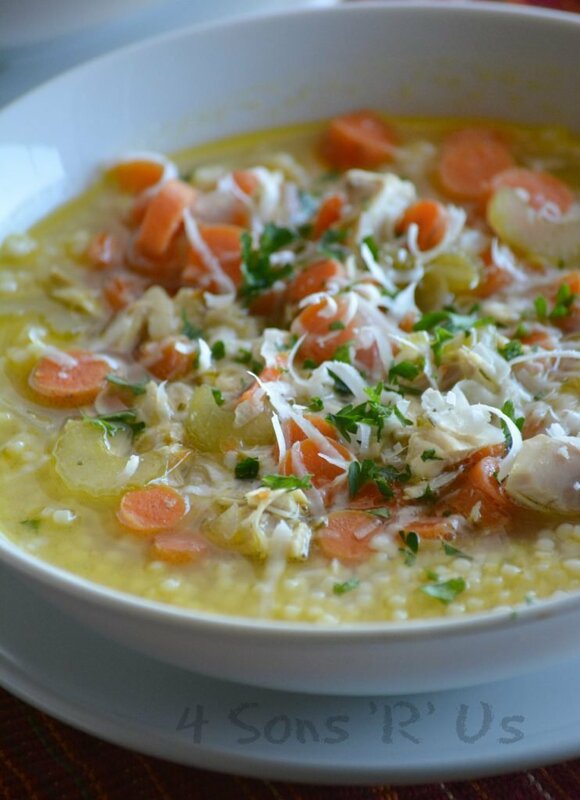 A quick and easy soup, you’ll be surprised by the rich flavor in such a simple recipe. Nonna’s Italian Style Chicken Noodle Soup tastes like Grandma slaved away at the stove all day stirring the love into every last drop. I am assuming by now we’ve all seen the Campbell’s Soup commercial for their classic Chicken Noodle Soup. It’s good. It was great, growing up it was a staple for many of us. But for my Italian husband it was different. Similar, but different. He grew up living far away from his Italian immigrant grandparents, but always looked forward to visiting them around the holidays, or any other time his young parents could afford to make the trip back home. Every time he’d come home to visit- because the Monongahela Valley outside of Pittsburgh has always been home for his family- he knew a pot of his Nonna’s Italian Style Chicken Noodle Soup would be waiting for him on the stove. He’d sit down to a warm bowl of his favorite soup, Nonna’s Italian Style Chicken Noodle Soup and slip the secret five dollars into his pocket his Nonna had slipped into his hand as soon as his parents had gone to unpack. Ahh, memories. Nothing changed in the enitrety of his childhood– every visit, same comforting soup, same loving grandma. When he took me ‘home’ for the first time, the smell greeted us before we even got to the door. After hugs and introductions all around, bowls of this liquid love were enjoyed by all. We love it so much, we can’t wait to enjoy it a few times a year. We’ve learned to make it ourselves, and share the memories and the love with our boys. Despite it’s irresistible-ness, I get my fill after one, okay two bowls. Then I’m good for another month or so. My husband? He would happily brush his teeth with the stuff. The kids too, and usually they regard soup as something too ‘unmanly’ to go gaa-gaa for. When they start arguing over who deserves seconds and lobbying with us– then I know it’s a winner. I can’t wait to share this family recipe with you. 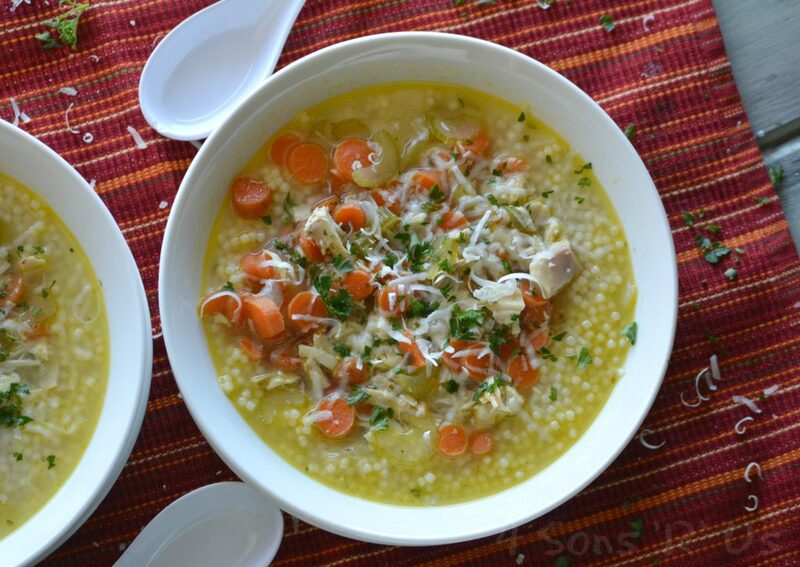 A rich broth is filled with tiny bits of acini di pepe pasta, chunks of juicy chicken, and sauteed veggies before being served topped with freshly grated Parmesan cheese and chopped parsley. 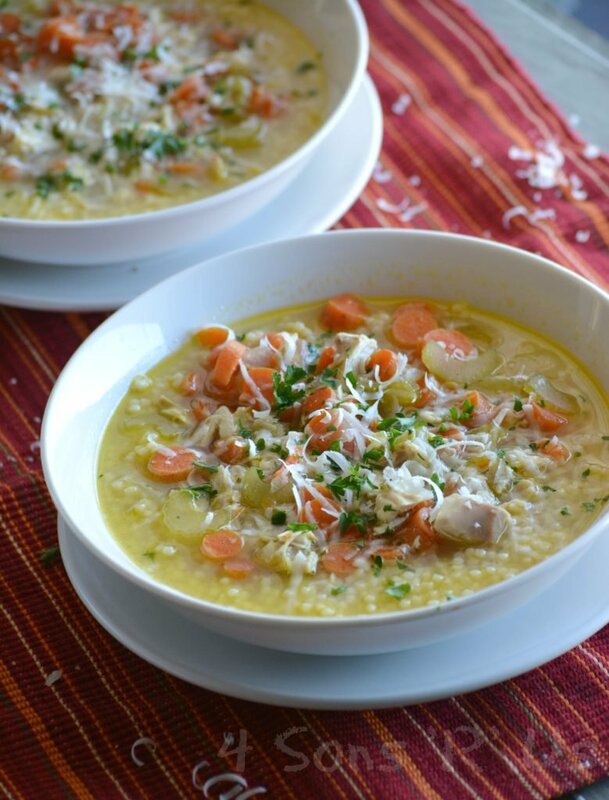 When it turns cold outside, when you’re feeling under the weather, or when you just get a hankering for a bowl full of ‘home’, make a batch of Nonna’s Italian Style Chicken Noodle Soup. It’s the answer to whatever ails you, in liquid form. 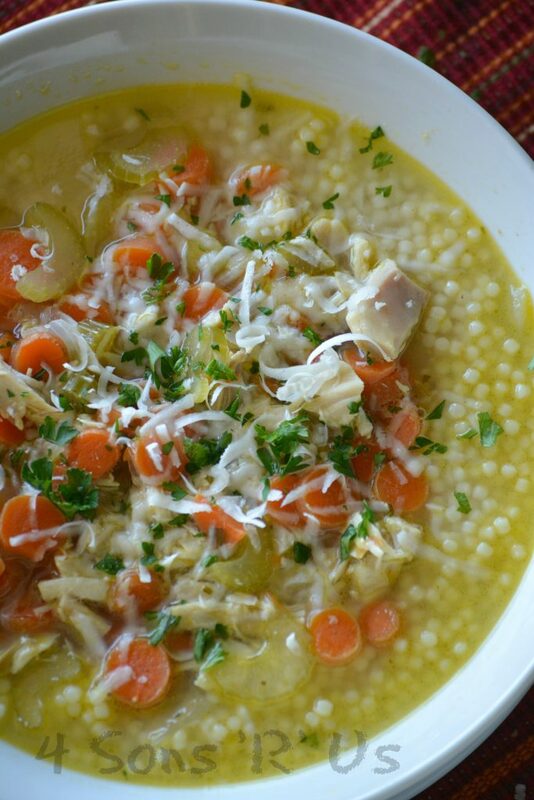 A different take on the classic chicken noodle soup, Nonna's Italian version is the perfect version for any occasion. To a large dutch oven, or other soup pot, add the broth, olive oil, celery, carrots, onion, and parsley. Over high heat, bring the soup to a rolling boil. Reduce the heat to medium and continue boiling for 15-20 minutes, or until the carrots are tender. While the soup cooks, prepare the pasta according to the package directions JUST until al dente. Immediately strain and run around cold water, stirring until all the pasta is cool to stop the cooking process. Set aside. Reduce the heat again, this time to medium low, and stir in the chicken, Parmesan, and salt and pepper. Let the soup cook an additional 5-10 minutes, stirring occasionally. To serve, ladle the soup into bowls. Stir in the desired amount of pasta into each bowl. Garnish shreds of freshly grated Parmesan and chopped parsley, if desired. This looks so comforting! Yum! What is Acini de Pepe? Soup sounds delicious and a good change from regular Chicken Noodle soup. June it’s tony little balls of pasta. They cook up into slightly larger beads. You could use any pasta and it would taste yummy. Ancini is just what our Italian family uses and it does pair well texture wise. Tried this and was really impressed — yum!! I’m wondering how this recipe could be modified to use a whole raw chicken instead? I just prefer cooking the chicken from scratch for maximum flavour. Sydney, of course! That’s an easy fix. We have a recipe on our site for cheapskate chicken, just swap the breasts for a whole bird. When a meat thermometer reads that it’s done, remove and pull the meat off the bones. Then proceed with the rest of the soup recipe, as written. Just wrote down the recipe I am also from the Mon Valley Area.. small world. My husband & I were literally just discussing this recipe, too! Small world!! I make this all the time! Used some egg noodles tonight. Love this recipe! What kind of broth do you use? Claudia, I actually don’t use broth. The broth/soupiness you see is created as the recipe cooks from water cooking the pasta and broccoli with the seasonings and creaminess from the cheeses. I’m going to try this soon. I live 5 miles from Monongahela. Little town called Elrama. Go to Foodland all the time. Very small world. This was so easy and delicious!! THank you for sharing! Was wondering if I could sub the fresh parsley for dried? So funny! I am of Mexican decente. I just made this soup. I’ve made it for years, except, I’ve never used acini de Pepe. 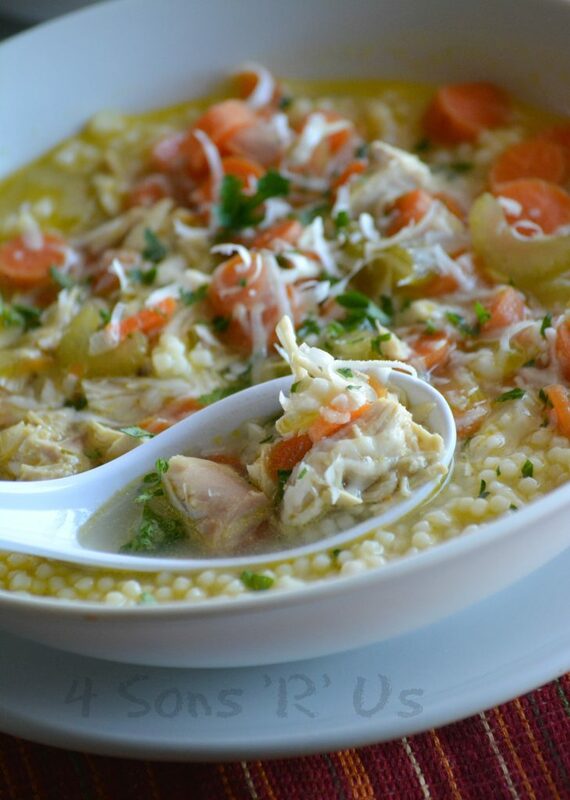 I have always finished my soup with Mexican rice. I am dieing to try these noodles that have been in my pantry and didn’t know what to do with. I know it will be a hit. Thank you. Yes, it freezes really well as long as you freeze before adding the pasta. Make that fresh when you’re ready to enjoy the soup.